India may need to adopt a model that keeps the individual components in a theatre under some form of dual control. There is now a proposal to amend the single service acts to legally facilitate more operational integration between the three military services. The goal is that command and control issues, which are single-service based, do not come in the way of joint operations and the future joint theatre concept. Some military legal experts have expressed their view that this has nothing to do with the desired operational integration. But any trigger to bring to light issues regarding integration, better command and control, jointness and resource sharing, is always welcome. There needs to be greater debate in the public realm about these things because transparency in defence matters can be healthy. There is a basic logic to the argument for ‘jointness’ and integration. The common aim of the three armed forces is to secure India against aggression and conduct such operations in the achievement of the national aim. To do this, they have different means, resources and work cultures. Without optimising joint capability, there is much wastage of resources. Also, the lack of a common work culture and procedures often places the achievement of the national aim at risk. It is the practice of integrating common technologies and available best practices with smart resource sharing that makes winners. The Kargil Review Committee (KRC) in 2001 strongly recommended the adoption of greater integration, and the appointment of a Chief of Defence Staff (CDS) to be the single authority for the government to consult, rather than individual service chiefs. There are many examples of integrated services around the world. However, the model to be finally adopted has to be an Indian one, based on the threat pattern, geographic factors, and distinct work culture. It is best never to copy-paste existent models, but examine each for its worth. The most common model quoted for integration is that of the US, which actually forced its armed forces into integration through a legislation in 1986; the Goldwater Nichols Act. It was the result of the perceived collective failure of the disastrous rescue attempt to evacuate hostages from the US embassy in Tehran in 1980 and the botched Grenada operation of 1983. All resources of the four armed forces (the Marines being the fourth element) were placed under different regional and task-based theatre headquarters.The theatre commander reports directly to the President of the US through the defence secretary (equivalent to defence minister in our case). The Joint Chiefs of Staff acts as an advisory body, with a chairman as its head. The individual service chiefs of the components do not assume operational responsibility, but are responsible for personnel, logistics and equipment aspects. Is such a model applicable to the Indian scenario? The answer is both yes and no. India has 17 individual service command HQs. The issue is whether these can regionally be integrated into theatres to ensure that no single service can claim primacy for its operations. Whatever model of integration is adopted, there has to be doctrinal guidance and placement of all resources in a single basket. The key question is the ability to accept one service as the lead for a theatre. The best example of this is witnessed in the Andaman & Nicobar Command (ANC) where naval primacy may be obvious and J&K where the Army may have to be in greater control. The issue of primacy, however, can pose obstacles in the path of integration. The Shekatkar Committee has included in its recommendations the appointment of a CDS and an integrated ministry of defence, but that’s exactly what the KRC also did. Here, the US model will make the service chiefs somewhat irrelevant. This is not a model which will be easily welcome in India. Our model may need to yet keep the individual components in a theatre under some form of dual control. Will this work optimally is something which needs intense debate. The responsibility for details of structures and resource sharing is surely that of the current military leadership, which can suitably seek greater advice from the strategic community. The critical question is whether the incremental approach towards theaterisation and integration is the right way or a sudden, transformational approach as adopted by the US in 1986. Baby steps such as amending service laws may not really lead to anything substantial. The government is on record to have taken a decision on the Defence Cyber and Space Agencies and a Special Operations Division, which the defence secretary has said will soon become a reality. However, a MoD shorn of expertise in the handling of these may surely not be the optimum way towards the future. One can perhaps visualise a potential compromise formula as a first move: creating a CDS holding all task-based commands and agencies (including Strategic Forces Command and ANC). We can also reform the MoD, infusing it with some uniformed presence. These can be the baby steps that eventually move towards a full-blown theatre command concept. Lt Gen. Syed Ata Hasnain (Retd), a former GOC of Srinagar-based 15 Corps, is associated with the Vivekanand International Foundation and the Institute of Peace and Conflict Studies. Theater Command seems to be a politically fabricated terminology unsuited to a purely defensive India. Basically what India needs is integrated command. Matrix structures cannot work as Unity of Command is a must during operations. Within each service, there is already the old system of specialized training and development from the early days of the Indian Army, You had specialists who were groomed in Training establishments headed by full Colonels while Battalions were headed by Lt. Colonels. Task forces were usually Infantry (Green Cap) led (sometimes Cavalry (Black Cap) or Airborne (Red Cap) led) and based on the task to be accomplished, were put together with specialist detachments of Sappers and Miners, EME, ASC, AMC and so on (Blue Caps) and disassembled at will for re grouping and training. Task force commands began, appropriately, at the level of a Brigadier. What we need is exactly an extension of the same principlerunning across the entire Armed Forces, whereby we have specialized training establishments in all three services and from which detachments or modules can be drawn and assembled for specific tasks and disassembled for regrouping after task accomplishment. 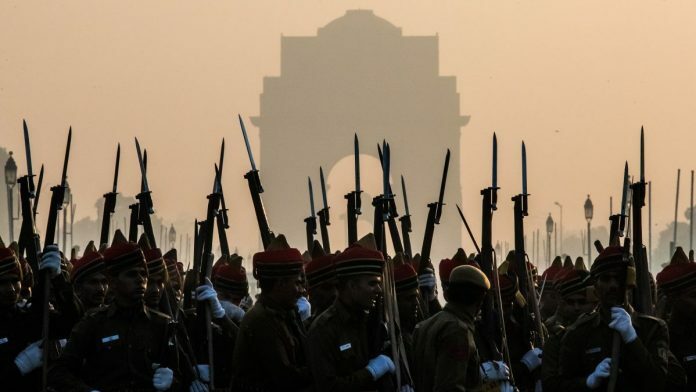 The current bureaucratic style of thinking which considers all operations in terms of static fields such as LOC has turned the Armed Forces into a sort of paramilitary border protection mind set more suited to the BSF than to the military.What really needs to be broken is the empire building mind set of the Brass Hats which has come to reflect the vices of their Neta-Babu.over lords. Once the armed forces are clear that the objective is to win battles and wars (rather than temporize or sue for stalemates like their Neta-Babu overlords) then you need the strategy formulators, a team of strategist staff officers familiar with the available capabilities of the various specialist modules and devising plans to quickly and economically accomplish objectives to assemble requisite force modules drawn from all three services for specific engagements. The assemblage itself needs to be under very clear command of the officer whose skills and experience are most apposite to the task at hand, irrespective of service. But before anything can be wrought, India needs to be clear as to why India needs a military, list the comprehensive threat scenarios, broken down into a menu of military objectives that can, again be assembled as theaters develop and reverse engineer a structure and static deployment that allows recruitment, training, and development of skill sets into modules that can be assembled and deployed to manifest an ability to apply adequate force to confront and vanquish threats and and where and when they emerge in quick time with minimal cost and investment. The title of the article indicates of evolving a mechanism for the integration of the three armed forces instead of copy pasting from the global armed forces. But Lt. Gen. Hasnain ends up doing exactly that. We have very poor “intellectually competent” Generals in the Army it seems! A General’s son ends up as a General. And after retirement they walk into the lap of ruling establishment as is very evident in the BJP govt’s case. No outstanding insight in Lt.Gen. Hasnain’s article as a solution ! !